German bread is The Best. Fact. 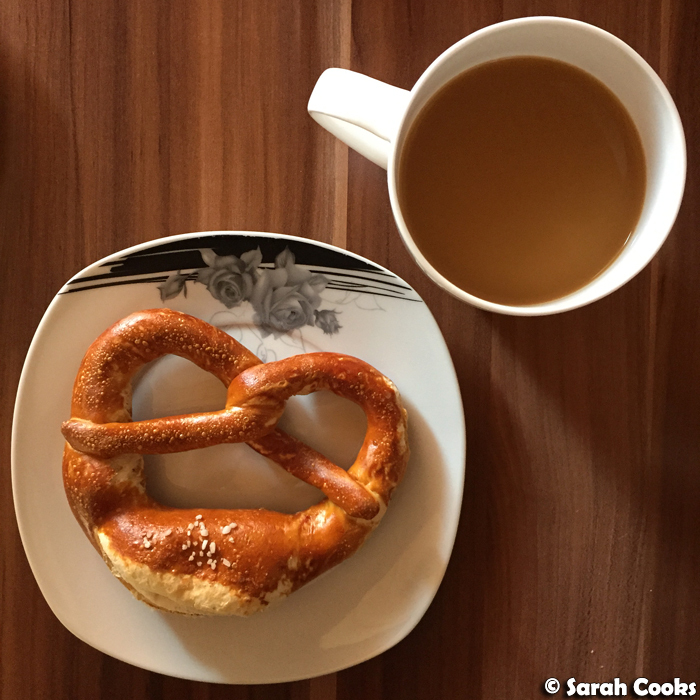 Therefore, German breakfasts are also The Best! Aah, August 2015 was a glorious carb-filled month. 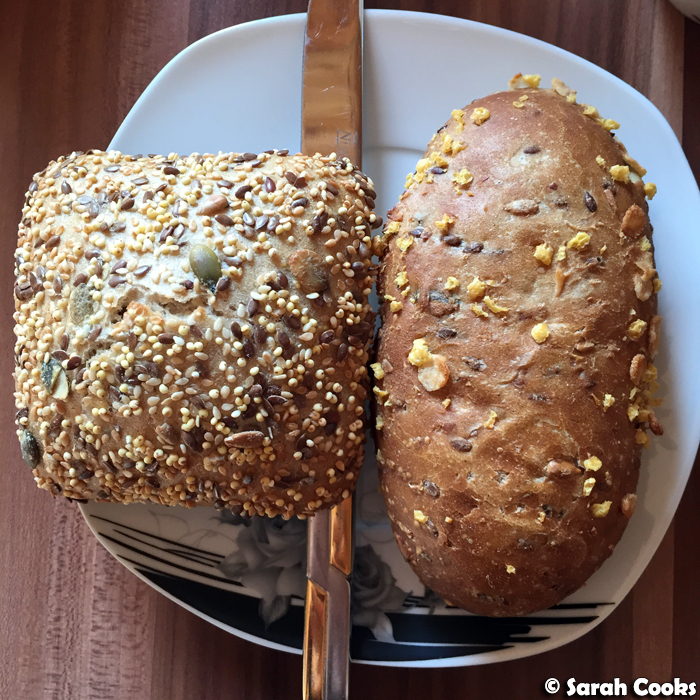 I've told you about my love for German bread previously, and for today's post I want to show you some of the lovely breakfasts we had on our most recent trip! Every night, Sandra's dad, Rudolf, would ask us what we wanted for breakfast, and would get up early to go to the bakery so that a delicious selection of bread would be waiting for us when we got up. Naaaaw! I usually made a choice reasonably quickly, but sometimes I was overwhelmed at the prospect of so many opportunities for deliciousness and I'd be stuck in indecision. Rudolf: What do you girls want for breakfast tomorrow? Me: Um... a pretzel. Oh wait, a plain bread roll. Or maybe a quark danish? Are they doing Berliners this time of year? Umm... this is too stressful, can you come back to me? Rudolf: Sarah, would you like to come to the bakery with me and choose yourself? Decisiveness has never been a strength of mine, heh. Anyhoo, before I get into the bread, let me show you a couple of breakfasts we had out. 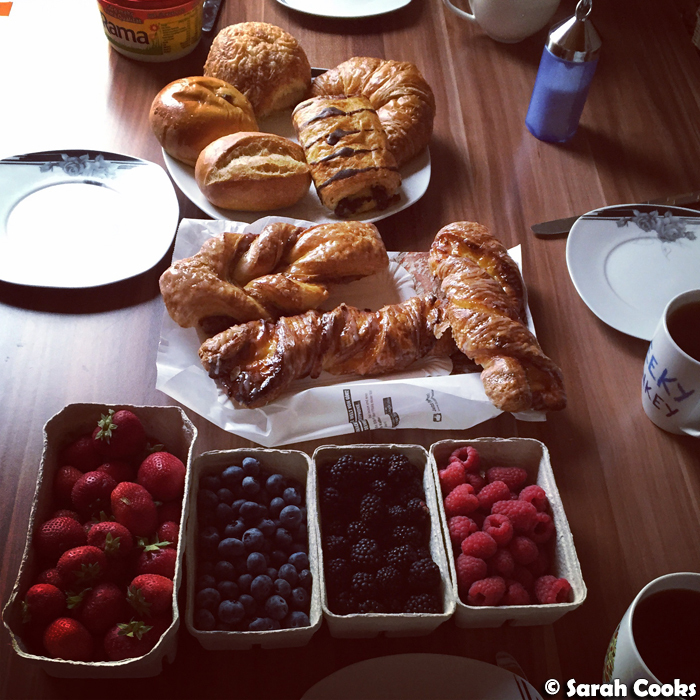 On our first morning in Germany, we went to the local Backparadies-Hug for brekky. They used to do a buffet breakfast, but they seem to have stopped that now. 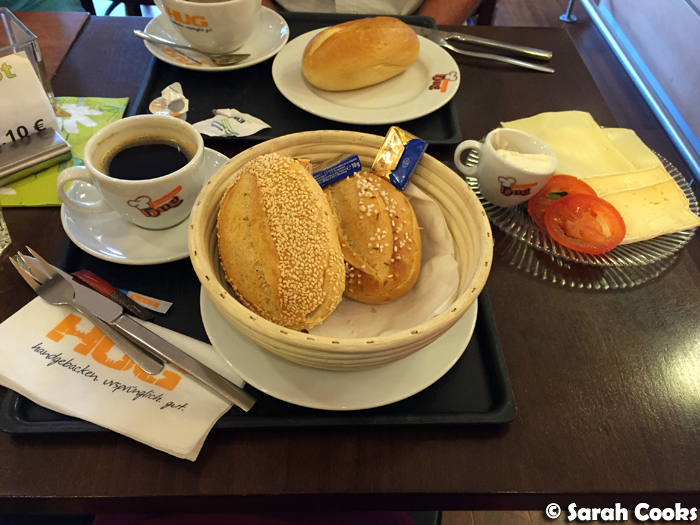 Either way, my Käse-Frühstück (cheese breakfast) was delicious, and excellent value at €4,95 for two bread rolls with butter, a coffee, 2 slices each of tomato, Camembert and Gouda, and a little pot of Frischkäse (similar to cream cheese). 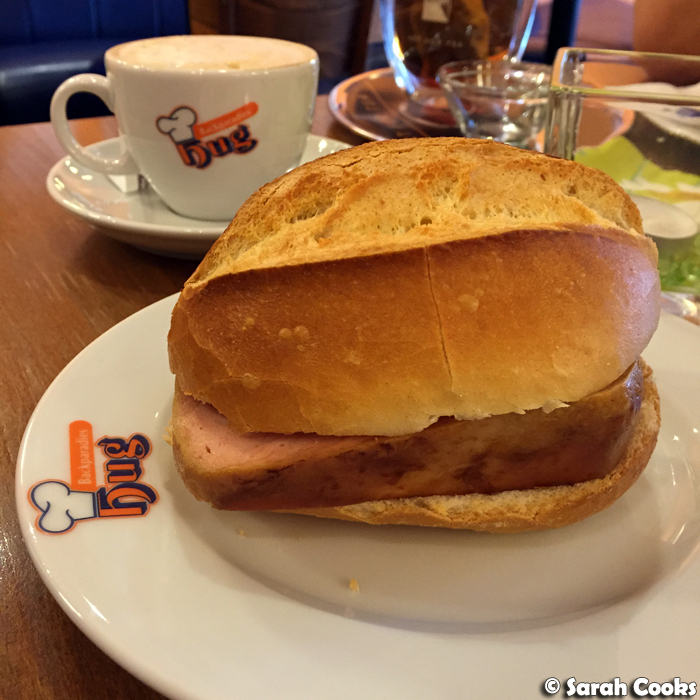 Fleischkäse im Brötchen (pork meatloaf in a bread roll) is also always a good choice. Another morning we did breakfast at Ikea. This is a thing in Germany! 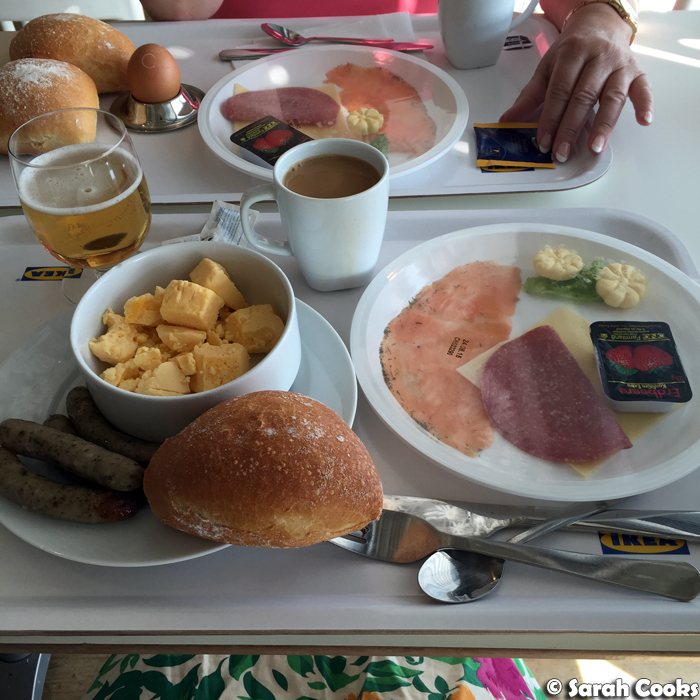 (See my "Breakfast at Ikea" post from 2007). The quality isn't quite as good as the local bakeries, but it is cheap and fun and they have a lot of different things to try. All of the Nurnburgers for me! (Those are the tiny sausages you see in the bottom left-hand side of the below picture). 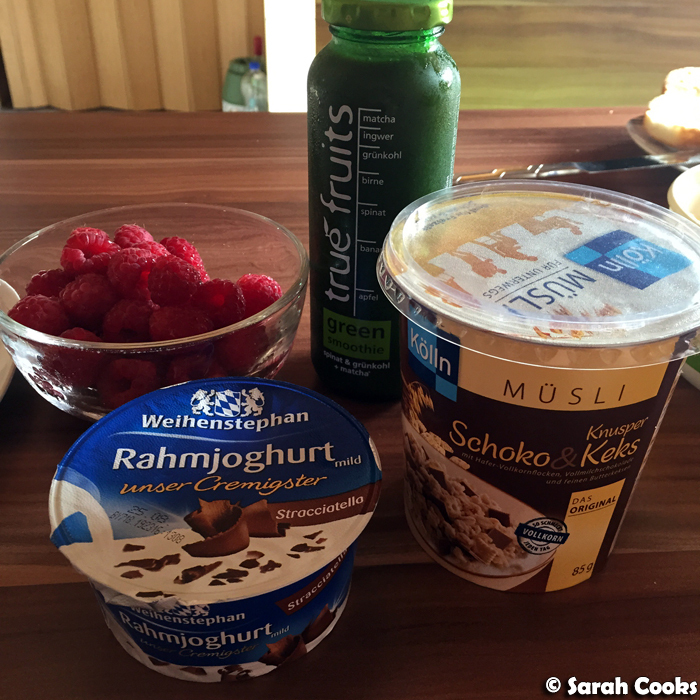 Back onto the breakfasts at home - I got into Rahmjogurt in a big way on this trip. 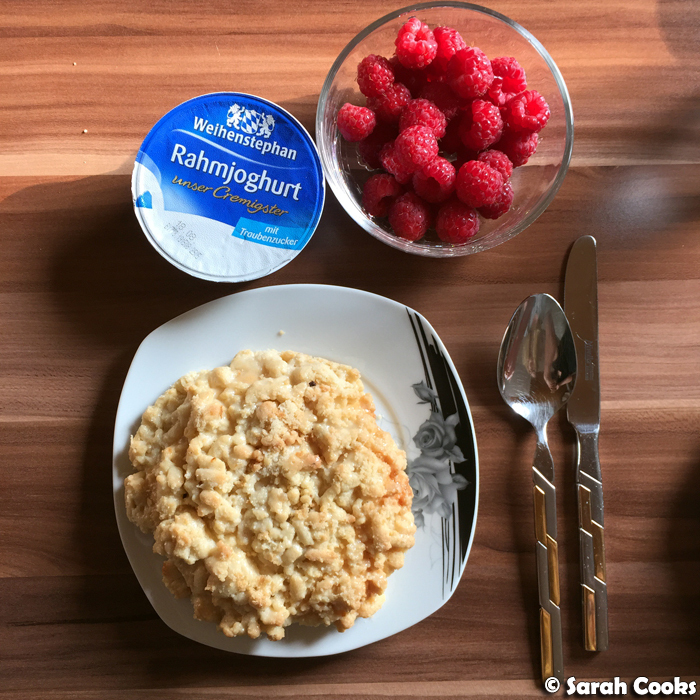 That's yogurt made from cream, not milk - so indulgent! The Weihenstephan brand was my favourite! That Schoko & Keks Muesli was also pretty ridiculous - normal crunchy oaty muesli clusters with little pieces of milk chocolate and tiny squares of butter biscuits! I bought that green smoothie (with matcha, ginger, kale, pears, spinach, bananas and apple) as a novelty, but it was no Green Press. Each morning I'd start the day with a strong filter coffee, with Kaffeesahne (i.e. creamer, or unsweetened condensed milk). One morning, there were water works going on in our street, and when I got up, Rudolf came up to me and said: "Sarah, the plumbers are in, we have no water... But don't worry, I already took out enough water for your morning coffee". What a sweetie! Ok, finally, let's look at the bread! Above we have a grainy bread roll. Below is a Puddingstreusel - a flaky yeasted dough topped with vanilla pudding and streusel crumbs. I also really liked the Hefestreusel - a sweetened yeasty dough topped with a generous amount of crunchy streusel crumbs. These are even nicer the day after they're baked, when they dry out a little and you can dip them in coffee. Quarkplunder! (Plunder = Danish, by the way). I got two from two different bakeries because I wanted to see the difference and I love quark! (This reminds me, I should bake Danishes at home again soon). Both were pretty similar, and equally delicious. Quarkplunders are my favourite of all the plunders. 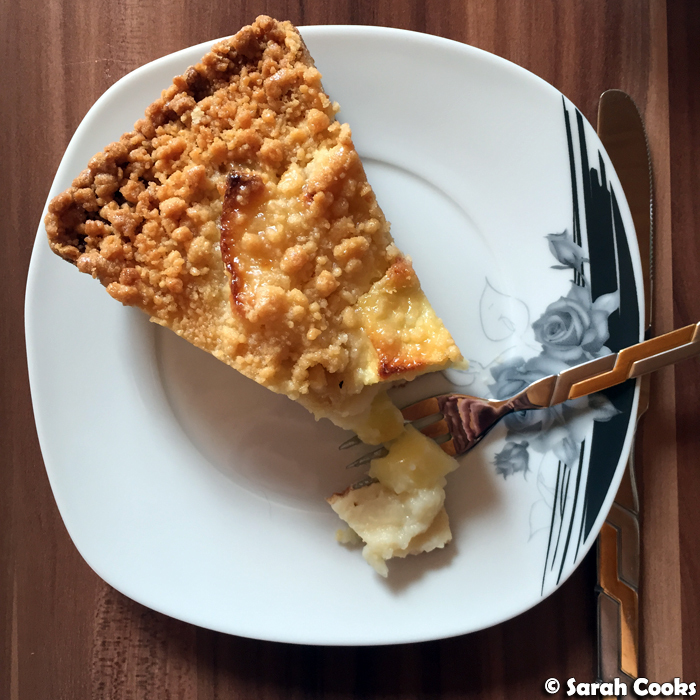 This is an Apfelstreuselkuchen - yeasted base with sliced apples and lots of crumble. The sides were deliciously crunchy and caramelised - yum! This next picture was from a big Sunday breakfast. On the back plate we have a Schoko-croissant, a normal croissant, a cheese roll (I think), a Rosinenbrötchen (raisin bread roll) and a normal white Brötchen. In the centre are a few Zopf (pastry twists), with nuts or pudding. And heaps of berries because I can never resist buying the cheap and plentiful berries when in Europe! 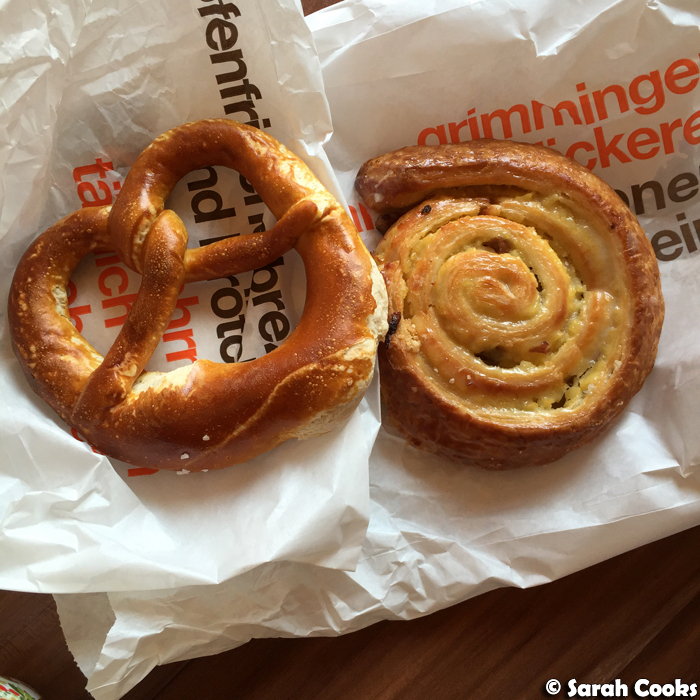 Below we have a classic pretzel, and a Schnecke (literally "snail", a yeasted and laminated dough with raisins). One morning when I was trying to be "healthy", I asked for some grainy rolls. ("Vogelfutter", or "bird food", as Rudolf calls them). Although I think any health benefits from the grains were easily cancelled when I filled the bread rolls with brie and salami! Whoops. On the left hand side we have a normal croissant, and a Laugencroissant. (That's a croissant dipped in lye solution before it's baked, so that it has a delightful pretzel-y taste). Also, croissants in Germany are different from French ones - they're a bit breadier and doughier in Germany and less flaky. 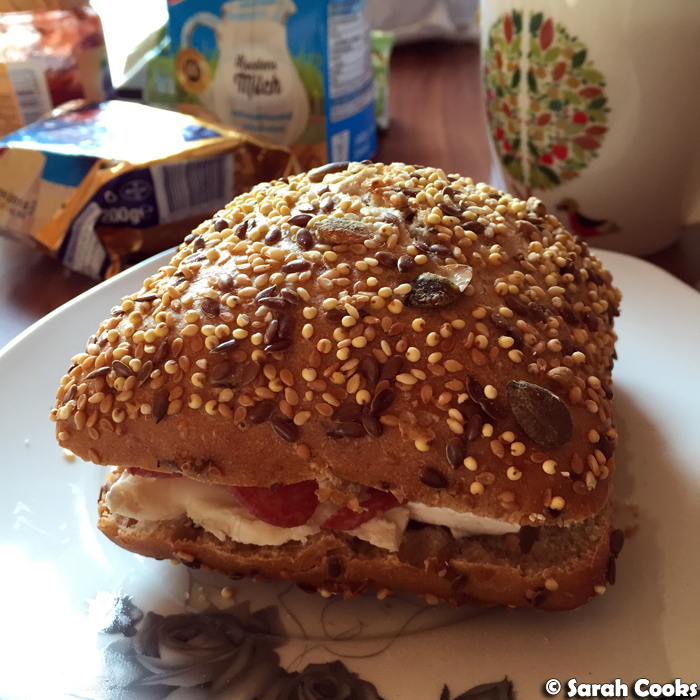 In the below pic, we also have a Rosinenbrötchen (raisin bread roll), and a Laugenstange. (That's a long bread roll, dipped in lye solution before being baked. Essentially, it's a pretzel but just in a stick shape). And there we have it! 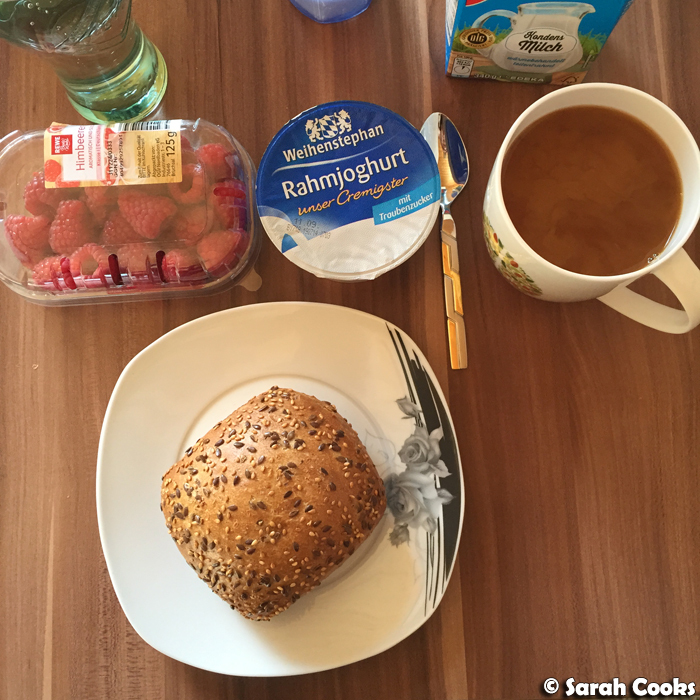 Wow, looking back at all those breakfasts makes me wanna book a trip back to Germany! And soon! Can we all have a Rudolf please? 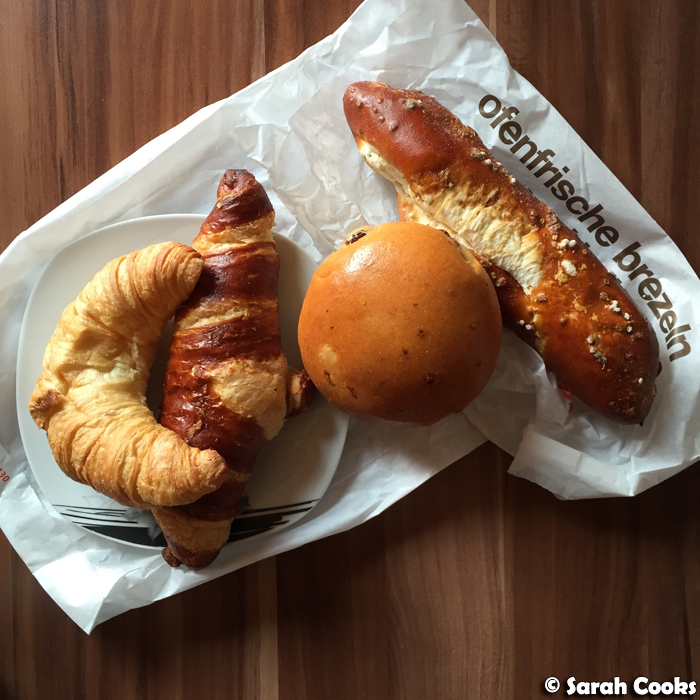 I've really liked the German breads that we've tried. There are a few bakeries here and they're really wholesome and delicious! I think we all need a Rudolf in our lives, what a lovely man!! So much carbs going on here, girl you holiday RIGHT! Makes me wish I knew people in Germany so I could be guided/helped to choose delicious things like this! SIGH. 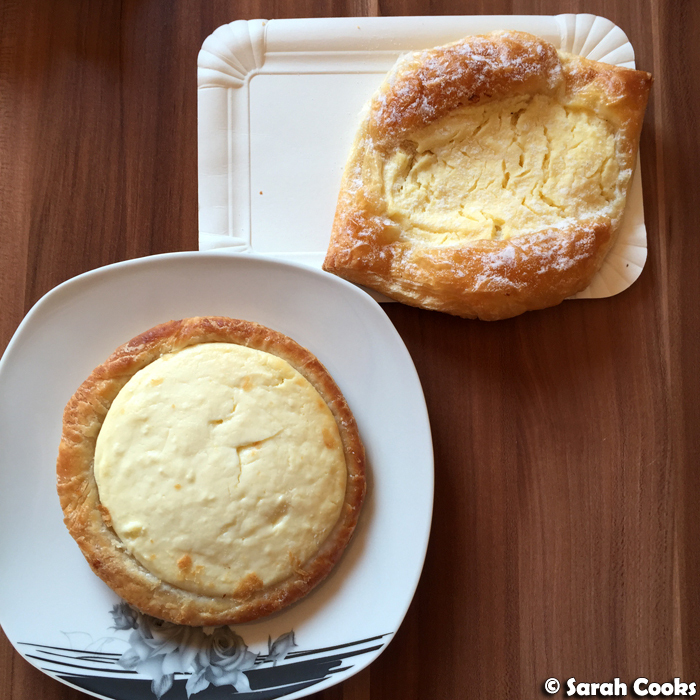 I lived in Hamburg for 8 years, and though I think the brötchen are better in the East (and the South) they were still to die for. 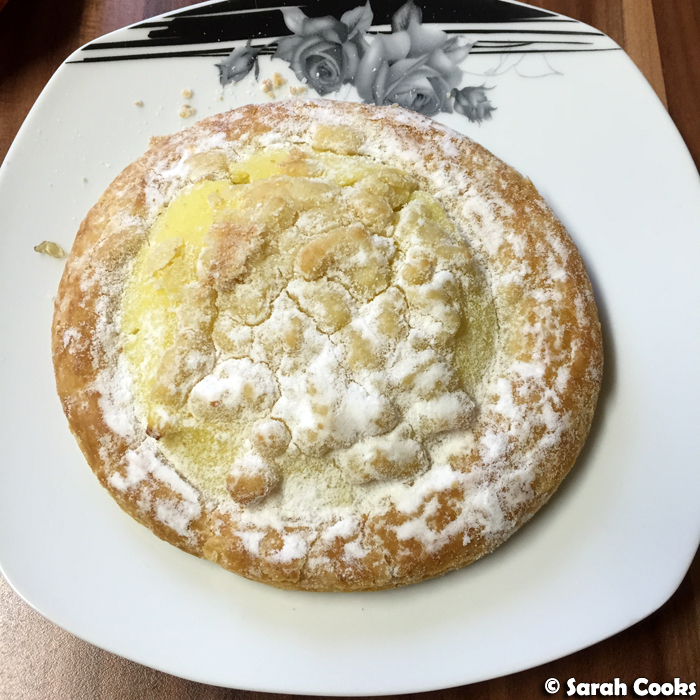 My partner was from East Germany, so she used to bake Streuselkuchen (plum, apple, plain) esp in Autumn. So good. I miss Laugenbrot of all shapes! omg, I'm dying over the streusel crumb bread. My aunt( thru marriage) is from Germany and my cousins were born there, but raised in the US. I have to ask my cousin why she has never brought me any German breads. LOL.